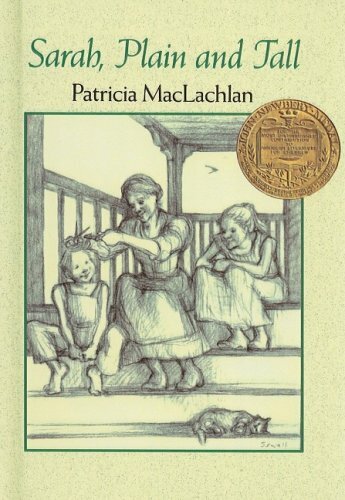 MacLachlan, author of Unclaimed Treasures, has written an affecting tale for children. In the late 19th century a widowed midwestern farmer with two children--Anna and Caleb--advertises for a wife. When Sarah arrives she is homesick for Maine, especially for the ocean which she misses greatly. The children fear that she will not stay, and when she goes off to town alone, young Caleb--whose mother died during childbirth--is stricken with the fear that she has gone for good. But she returns with colored pencils to illustrate for them the beauty of Maine, and to explain that, though she misses her home, "the truth of it is I would miss you more." The tale gently explores themes of abandonment, loss and love. The Sarah Plain and Tall series is great. My kids love reading them and we have also read them together at bed time. They are short and easy to read and the stories are beautiful and heart warming. Patricia MacLachlan is a woman who knows how to use words effectively without wasting them. Love all her stories. 8/12/2007 Christy Evers said: A sweet book. I was drawn to the characters immediately. It tugged on my heart.